Hosting Thanksgiving at your house, and still need a table centerpiece? 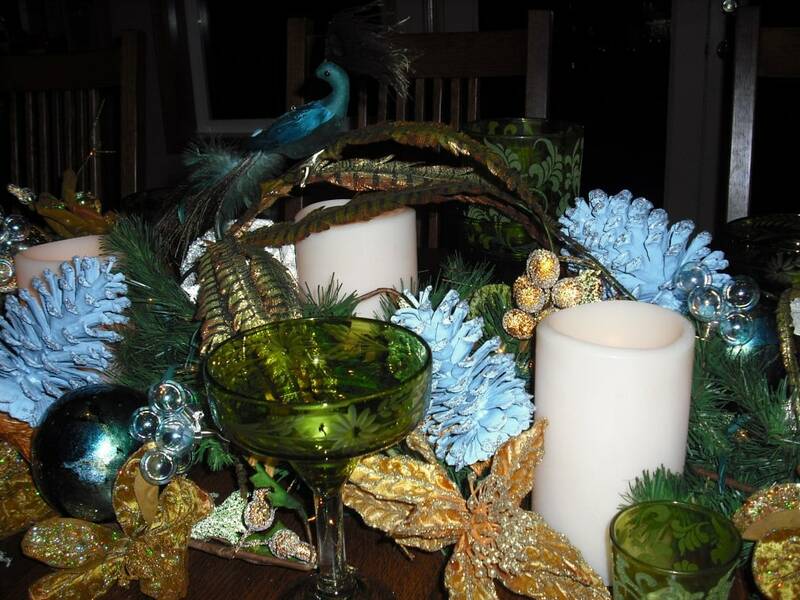 Here is a frugal way that my (Sia) mom, Debi from Misty Meadows Gardens, uses to decorate her table in a pinch. The pictures are from her table centerpiece, but could be modified to match any homes decor. The three key components include: Spray Paint (as low as $.97 at Walmart and Home Depot), Glitter and Found Items from your yard and around the house. Have fun! Its just a centerpiece after all. The real fun about the holidays is enjoying family and friends. 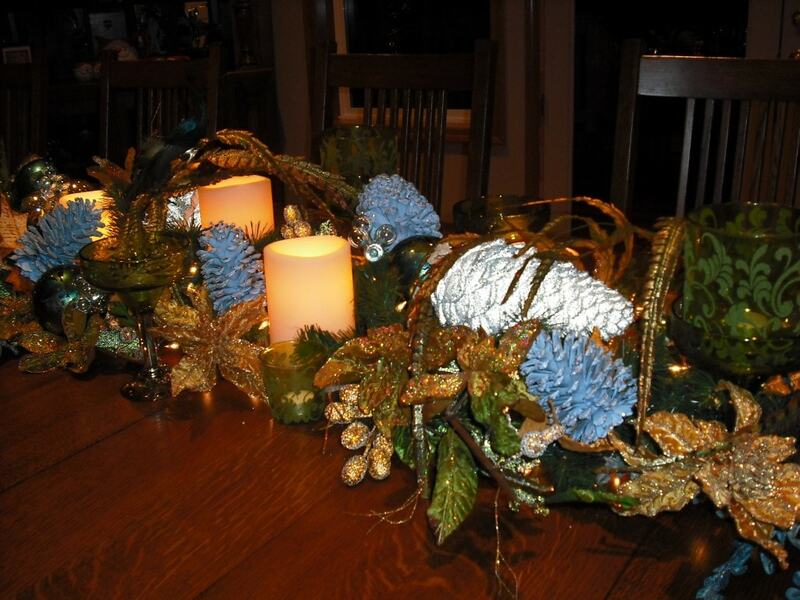 First she sprayed her pine cones blue and leaves gold (use what colors go with your holiday decor). Next she added some glitter for sparkle (you can buy this in spray paint cans or add glue dabs to your items and sprinkle glue over them and allow to dry). In the close up photo above you can see how she layered her floral items, martini glasses from her cupboards (she even placed water glasses in the martini glasses periodically for height and layering). Lastly she added a string of Christmas lights and some candles (she used the battery operated ones for safety). Layering, Lighting and Lift = LOVE IT! 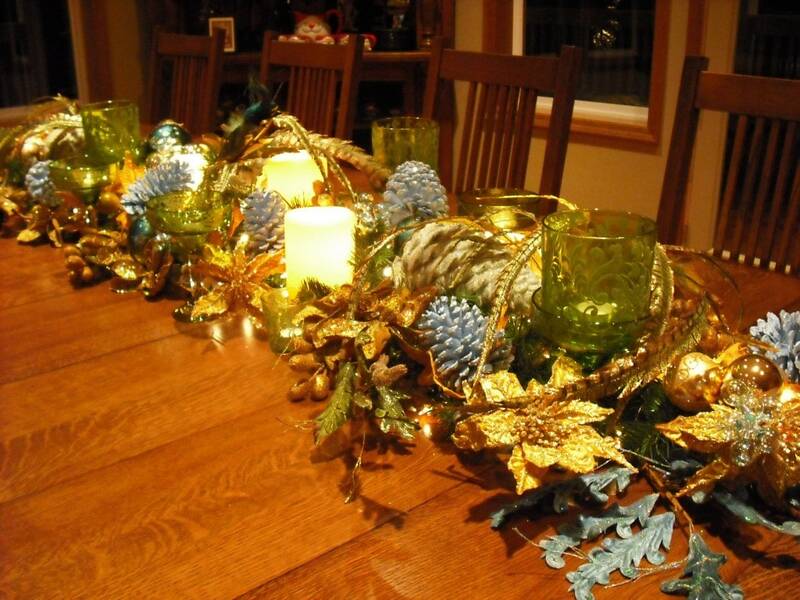 Let us know what found items you have around the house, that you were able to re-purpose for frugal holiday decor!